Yesterday India's Supreme Court legally recognized the country's neither male or female third gender, and declared them entitled to the same education, jobs, and driver's licenses as those who identify as male or female. To Western eyes, this ruling is unprecedented given the same court's recent outlawing of homosexuality. 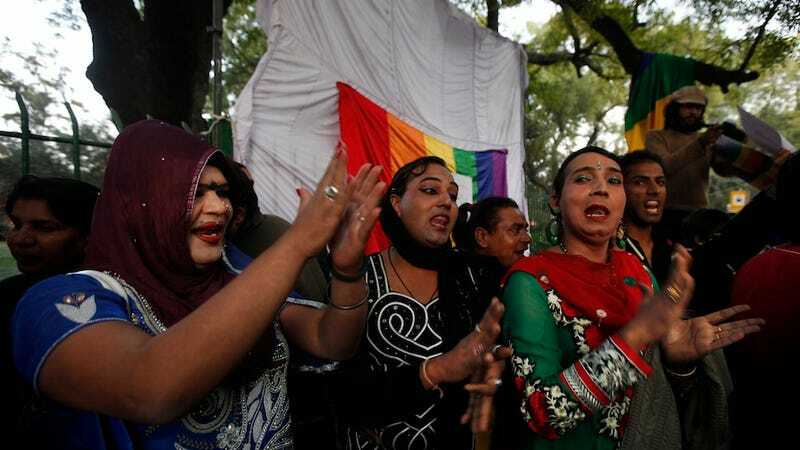 The Supreme Court's ruling specifically targets the hijra community, which is mainly associated transgender people, but also includes other non-male or female identified citizens. The hijra have been instrumental in some of India's religious epics and ceremonies, but who have faced discrimination and segregation in modern times, especially because of people's association of this lifestyle with homosexuality, as trans filmmaker Rose Venkatesan puts it. Recognition of transgenders as a third gender is not a social or medical issue but a human rights issue...[transgender people are] sidelined and treated as untouchables, forgetting the fact that the moral failure lies in the society's unwillingness to contain or embrace different gender identities and expressions, a mindset which we have to change." A new Supreme Court bench is reconsidering the homosexuality ruling from four months ago. Perhaps they will change such a decision in a spirit similar to the quote above.